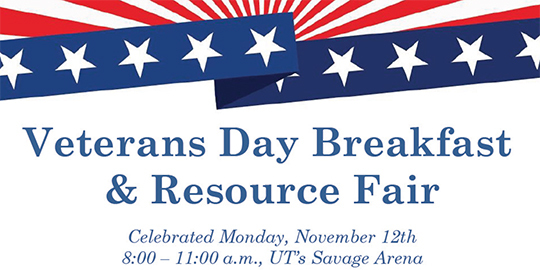 The 14th Annual Veterans Appreciation Breakfast and Resource Fair will be held Monday, Nov. 12, at 8 a.m. in Savage Arena at The University of Toledo. Through the collaborative efforts of UT, the American Red Cross, and the Lucas County Veterans Service Commission, this breakfast and resource fair gives the community an opportunity to honor area veterans and active service members for the sacrifices they have made for the United States. Along with a free breakfast, the event offers all local veterans, members of the military and their families access to more than 30 military-focused community resources and a drive-through car care clinic offered by Tireman Auto Service Centers. There will be historical military vehicles and women’s military uniforms on display from the Neff Military Museum in Findlay, Ohio, recognizing more than 100 years of service by females in the armed forces. Retired Cmdr. Meghan Michael, former commanding officer of the Navy Operational Support Center, will give the keynote address at the event. Michael served as mission commander and tactical coordinator in the P-3C Orion, deploying to the Middle East and Asia. The pinnacle of her career was flying missions in support of ground troops in Afghanistan shortly after 9/11. She currently serves as the co-chair of the Northwest Ohio Military Affairs Committee and is the owner of HR Navigator, a company whose mission is educating small businesses on attracting, hiring and retaining veteran employees. The program also will include some younger community members who will pay tribute to the veterans with entertainment and support. Members of the Rossford High School S.O.S. (Serving Our Soldiers) Club will greet participants and assist veterans through the breakfast line. Musical entertainment will be provided by fourth-grade students from Waterville Primary School and the UT Jazz Ensemble. “This event is all about honoring our local heroes. We are grateful for the involvement of students from area schools to help us in this effort,” said Rachel Hepner-Zawodny, executive director of the American Red Cross Northwest Ohio Chapter. Free parking will be available in lots 3, 5 and 6 near Savage Arena. For more information on the event, contact the UT Office of Special Events at 419.530.2200 or specialevents@utoledo.edu. This entry was posted on Wednesday, November 7th, 2018 at 3:42 am and is filed under Events, News, UToday .